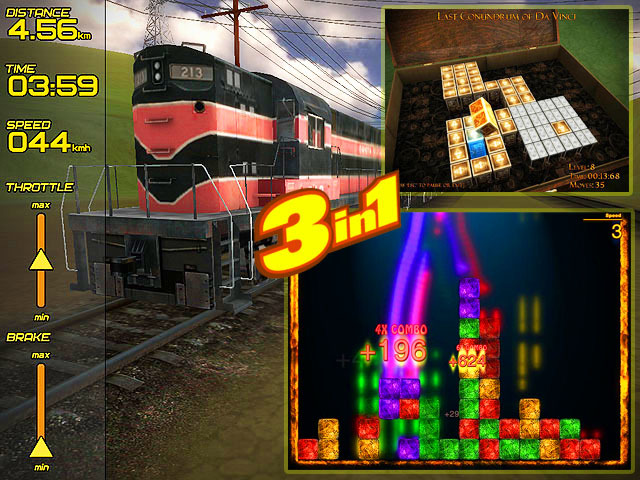 Set of three smart games - Freight Train Simulator, Color Bricks and Last Conundrum of Da Vinci Deluxe. These games will not let your brain relax for a moment. You have to get the trains to their destination on time, dispose properly bricks to get more points and solve the mechanical puzzle of Leonardo Da Vinci. Try to complete 10 missions in different locations in the world freight. Avoid high speeds in the curves, otherwise derailment can happen. Logic game, explosive mix of match-3 and Tetris-like games. Complete 67 levels of the ancient mechanical conundrum of the worldwide known greatest inventor, scientist, and artist Leonardo Da Vinci and discover 8 of his greatest masterpieces.